In the realm of the spirit when I was praying, God opened my spiritual eyes and I saw what will happen after the national dialogue is chaired. In my vision I saw a huge confusion coming between the two political part PF and UPND. And later on, I saw the PF with an agenda of stopping HH from contesting in 2021 and later own I saw the UPND with the same agenda of stopping Edgar Lungu. In my vision, I saw the two political parties start the confusion and I later saw the national dialogue was not successful and it will not reach its intended purpose of bringing peace and unit but It will just increase the confusion among the two political parties. Both PF and UPND are not ready for the dialogue, they have bitterness for each other. For 2021, the race is not an easy race. There will be confusion in Zambia. Things will be destroyed, fire break ups will be around the country, Zambia will be on international headlines in 2021 because I saw carders of political parties fighting one another and bloodshed will be in the country among the carder’s things will be destroyed, roads will be broken because what will make this will be a delaye of announcing results. 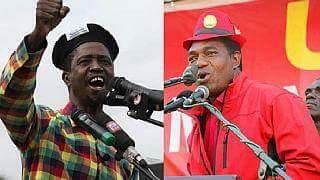 Later own, I saw in my vision HH is the one with favour and grace to win through a ballot paper but Edgar has no grace and chance to win in 2021 but it will be very difficult for Lungu to give power to HH, he will reach at a point of wanting to give power to a party which every one was not expecting to win. Pray for Zambia, Zambia is in a valley and HH should pray much because its his time and chance to rule Zambia but it will be not easy for Lungu to give him power he will reach to a point of giving it to a political party which is not even famous. The alliance of the opposition its not going any were because many of those in the alliance are working with PF to destroy Hichilema. That is your opinion baba, not for us. Ifwe ni forwardfye . for the bloodshed I rebuke in name of Jesus Christ we don’t want bloodshed in Zambia..
Rubbish – These prophets with their prophecies are the new terrorists. Soon they should be treated as such. Such careless predictions are like announcing election results prematurely – that is tantamount to inciting chaos — the Biti style. Such ALARMISTS must be arrested and thrown into prison. False prophet – that is what the Bible calls YOU. Shameless prophet of DOOM! YOU are DOOMED yourself. Zambia please PRAY for this idiot! The day the so-called called prophet decides to worship The True Living God, he shall speak the truth, not this nonsense. He’s trying to lure HH and GBM into tithing to his kantemba church. I pray that God saves his soul before he perishes. Ba Prophet with your prophecy be wise and open your eyes nicely….your prophecy has no wisdom…i think you’re still young spiritually… am sorry to say this…just compare your prophecy with the words of the Lord…. prophecy comes to do nothing but three things…1corinthians 14:3….but he who prophesies speaks…edification, exhortation and comfort. Our God is not the author of confusions… 1cori 14:33..
you should know to differentiate between word of knowledge and prophecy….mwilatusebanya bane…. As you call yourself,to being with I want to ask you a question, Are you a prophet for the Devil or Almighty Jehovah? ?.Don’t alarm violence in Zambia, we are a peaceful country and we are enjoying it.so reverse your statement back to the owner.THE DEVIL COMES TO STEEL,KILL AND DESTROY I CAN SEE YOU ARE AN AGENT OF IT,BUT WE REBUKE IT IN THE NAME OF OUR LORD SAVIOUR JESUS CHRIST. sure you are even proud saying it. Dialogue smooth I declare,2021 election peace regardless change or no change of president in Jesus’name. Ok will look forward to that. What are you doing about what you saw in your vision? For I know that the prophets of old when they saw something bad coming or when uttered dooms upon the people, at the end they provided solutions. What should we do as a country? INE WITH SUCH PROPHETS AWE NAKANA,ZAMBIA HAS ALREADY CROSSED THE BRIDGE OF WAR,GO AWAY WITH YO WAR PROCLAMATION. was anointed to continue with the work. God has SEASONS for every work on earth.